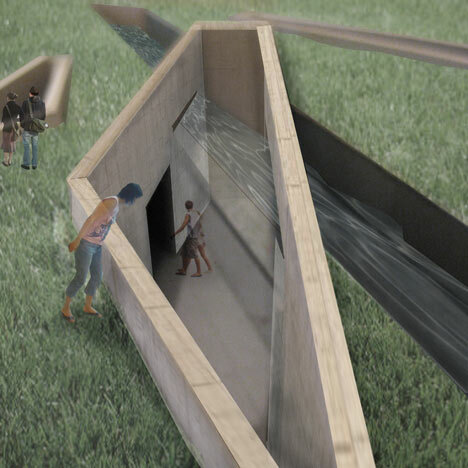 London Metropolitan University graduate Charlotte Wilson was awarded Best in Show at London graduate show FreeRangethis year for her proposal to convert a bunker into a museum. 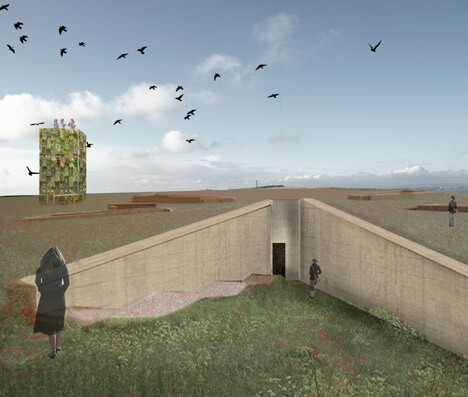 The existing RAF Bempton bunker in Yorkshire, UK is built into a cliff-side and would be be transformed into a museum celebrating the role of women during war. 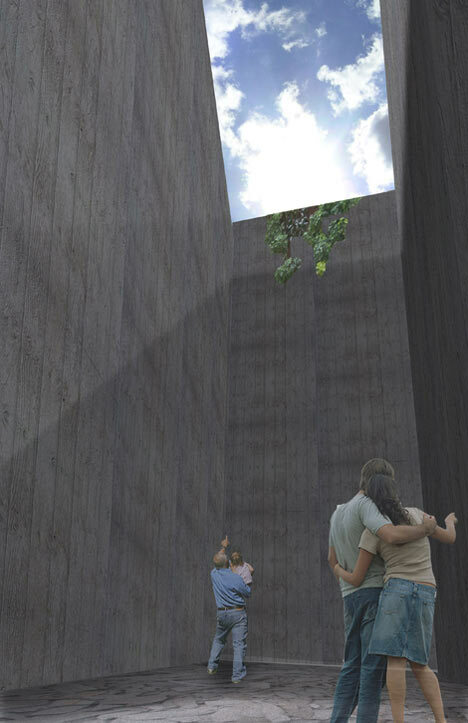 The bunker would be dug out in areas to reveal its three metre-thick walls and create a series of courtyards open to the air. A glazed roof over one section would have water flowing over it and down a wall etched with the names of pivotal women from past wars. Part of the bunker would protrude out of the cliff to create a viewing platform over the sea. “Situated within a unique cliff side location in Bempton lies the RAF Bempton bunker. Disintegrating and of great historical interest, it is proposed the site will be sensitively renovated and reclaimed. ‘Women . War . 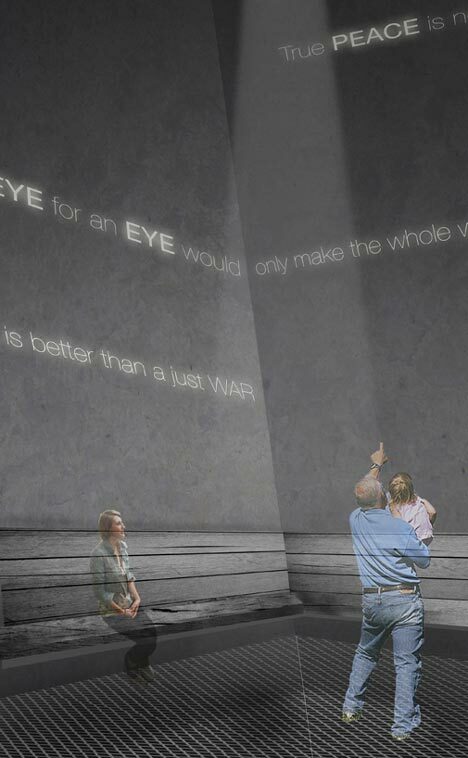 Peace’ will be a new and exciting war museum with the pure focus of Women and War. Journeying through the exhibition will illustrate the compassion, realism, horrors and bravery seen and felt through the eyes of women during war time, both on the front-line and behind the scenes. This museum interrogates the creativity of learning through emotional and experiential spaces and details. By breaking out of the bunker from it’s central pit space, the architectural language conveys the juxtaposition between the protective shell of the bunker and it’s contrasting dangerous subject matter. 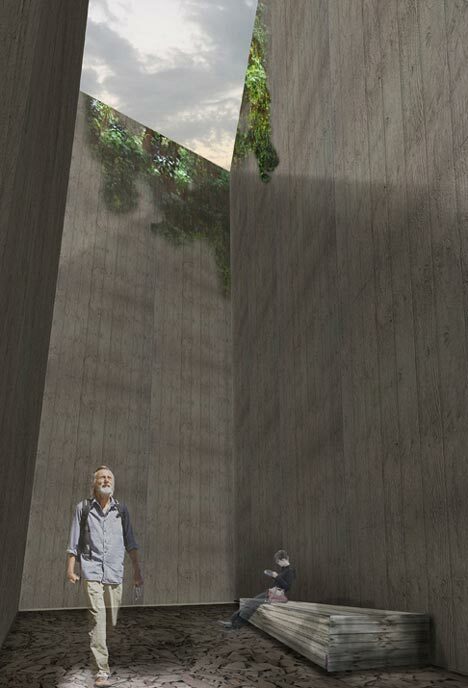 Through this process the bunker’s thick 3.3 metre walls are revealed and with this, external underground courtyards are created, allowing for pause and contemplation throughout the experience. The whole experience will be of constant enlightenment, with natural light increasingly puncturing underground and views being progressively exposed. Past. The main Exhibition Space is located within and around the bunker with the focused narrative being of the two different stories of ‘Women at War’ (situated within the bunkers walls) and ‘Women at Home’ (breaking out of the bunker to create new spaces). This gives the idea of the Women at Home being ‘Behind the Scenes’ and supporting the Women at War. This experience will house the stories of Women from 1914 to 2000 through interactive stations, silo spaces and archived resources with the experience being of an intimate nature. At the heart of the exhibition is an interactive time line structure which contains an immersive eerie environment within it’s walls reminding the visitor of ‘absence’. This structure is impertive as a collective point and a place to delve deeper into the information. Present. This experience takes place within the Souterrain and courtyard spaces and is dedicated to the stories of women of war from 2000 to the present day. 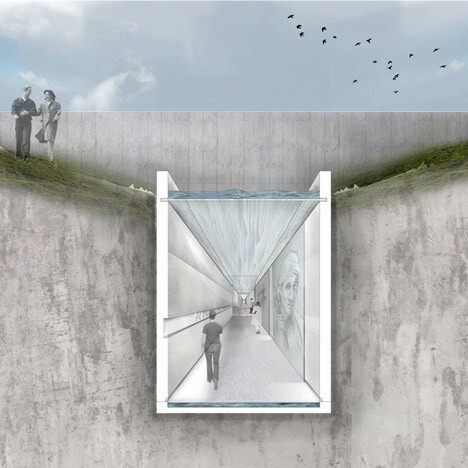 Water flows along a glazed roof and enters into the space flowing down a wall, etched with the names of admirable Women, before the tunnel punctures through the cliff face to reveal a viewing platform over the sea. Reflection and Remembrance. 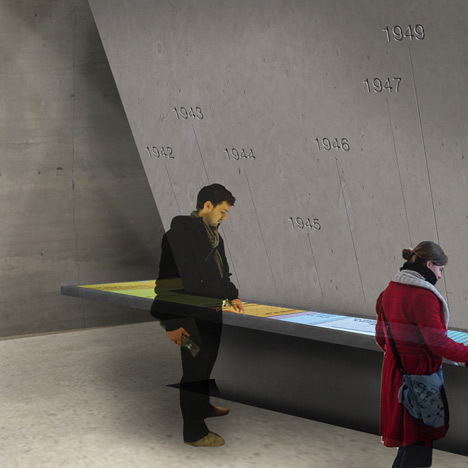 This viewing platform allows for the visitor to reflect over the information gleaned whilst looking out to sea. As this space is partially exposed, visitors will begin to feel a sense of freedom as they listen to the birds song.